Thread: Blast-off From the Past - Author Dave S.
I thought this might make an interesting little aside on a Friday afternoon (I am useless at work at this stage of the week). It vaguely relates to a reference by T.R. to an article describing the Cartier Santos as the first pilot watch, but is a bit off-topic, so bear with me. It reminded me that, reading in another forum, I had been interested to see that it was stated that the famous astronaut Neil Armstrong not only wore his issued Speedmaster in space, but also, on the 1966 Gemini 8 mission (Armstrong’s first), wore a watch on his right wrist that belonged to James (Jimmy) Mattern, a 1930’s aviator, and clearly an inspiration to the up-and-coming Armstrong. Now I know that Space watches is a whole area of study in itself, and one that I am not qualified to speak with authority on, but this little story appealed to me. The world’s most famous astronaut (originally a pilot), on his first space flight, wearing, by his own choice, a 1930’s watch on an early mission that was a near disaster. A watch iconic in its time and owned by a famous pilot of nearly 40 years earlier, passed on to an astronaut headed for great things. The Gemini 8 mission was the first ever to dock vehicles in orbit, but is best known for the problems encountered when a manoeuvring thruster stuck open and started rotating the vehicle at up to 1 revolution per second, which must have led to some unsightly decoration of the interior of the Gemini module (Astronauts they may be, but they are human all the same). The problems were solved, a planned space walk by Scott was abandoned as a result of the problems, and a successful return to earth was achieved, allowing the crew to fulfil their destiny. Tea and medals all round. Wiley Post flew solo round the world a mere month after Mattern’s failure to do so and claimed the record. At this time in the 30s it seems that Wittnauer (according to their own website timeline) were equipping almost every famous flight going, from Howard Hughes to Amelia Earhart, and including Wiley Post who got the record that Jimmy failed to get. They are not specific as to whether they were supplying the planes’ timepieces or wristwatches, but the former is more likely. Anyway, it seems logical that as Armstrong was wearing Mattern’s watch, it would have been his All-proof (or Allproof), but I can find no reference to this. All sorts of stunts were staged to prove this, including dropping it from planes, the Empire State Building and so on. Subsequent to Jimmy Mattern’s adventures, a later version of the watch was issued which celebrates his achievements (?). A pair of pictures is below (found in a US auction site – no longer for sale). Note that the oil company on the caseback were the backers for Jimmy’s adventures. The new bit that I only recently discovered (this morning) came from spacearchive.net, which holds a lot of high definition (>9 MegaPixel) shots from the NASA programs and others. It is a shot of the landed Gemini 8 module in the process of recovery in the Pacific. 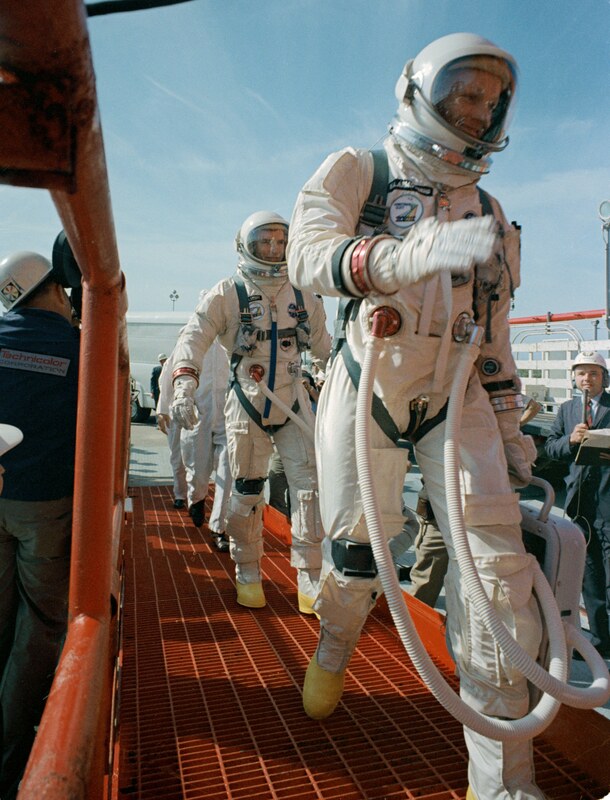 Armstrong and Scott are clearly seen, still in space suits, sporting their Randolph Engineering Sunglasses and no doubt delighted to be bobbing on a sunny ocean rather than spinning away in orbit. More interestingly for us one can zoom into the picture and have a look at the man’s right wrist. There we go. Fuzzy, but this is clearly a watch, above the wrist collar on his space suit. What is more, it clearly is not his Speedmaster, as the dial is definitely not black, seeming to be only a little darker than the white of Armstrong’s suit. Is this Jimmy Mattern’s Allproof? It certainly could be. At the time of this photo, this would have been a 40 year old watch that has survived pioneering aviation in the 30’s, an escape from the bleak wilderness of Siberia, being dunked in Siberian rivers, space flight, near disaster in orbit, re-entry and splash-down. This is speculation, I know, but one has to acknowledge that that’s not a bad CV for a 1930's timepiece. If this is right, I wonder where it is now? I hope Mr. A continues to look after it and get it serviced regularly………. OK... pretty late on the scene, here, and digging up an 'uralt' (i.e. ancient) post, but I just wanted to say: thanks! What a fantastic post...! I agree with the above post. Few sites equal the value-added proposition of ATG. Well done, Al. Hope your back is coming along, mate. Actually, it's one of mine, copied from the old forum. My only post script to this is that I have managed to pick up one of these ancient beauties, for a tenner! I'll get busy with some photos. hey Dave... I am always good for a 'well done Al'.... I get so few...lol! Another post script on this one. Scott and Armstrong discuss taking up Matterns watch and a piece of a 1924 biplane with them. "Neil wore the watch that a wonderful guy called Jimmy Mattern, now a real estate agent in Desert Calif. had worn when he attempted the first solo around-the-world flight in 1933. Jimmy's plane had a frozen oil line and cracked up in Siberia, so we decided to make sure the watch went all the way round the world this time"
"It was almost 11 hours since liftoff, and Jimmy Mattern's old wristwatch was still keeping good time." It is nice to get some confirmation after all this time.